Once on the show floor, we were allowed to approach subjects closely enough to use our own camera. 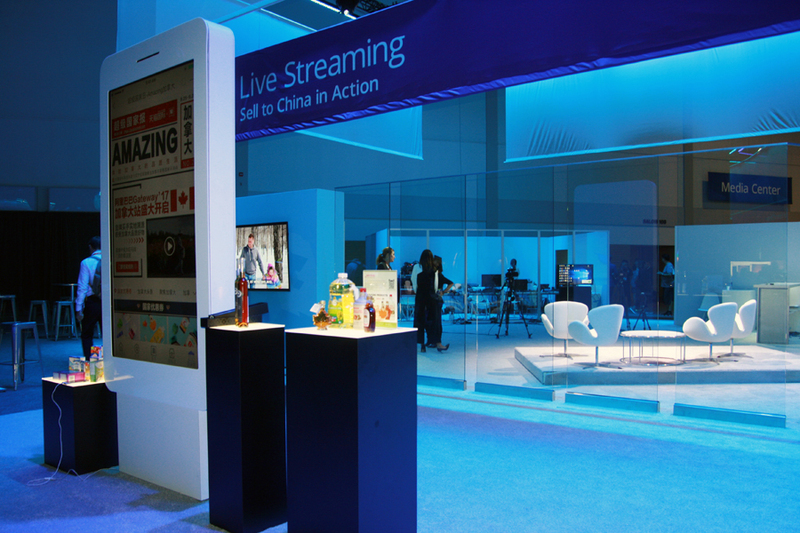 This booth is equipped for China in Action, a livestreaming platform in which merchants are invited to pitch their products and interact with consumers through Alibaba’s mobile Taobao app. “It’s a live opportunity for Canadian businesses to interact with Chinese consumers and Chinese merchants,” our guide Sharon Chan explains. 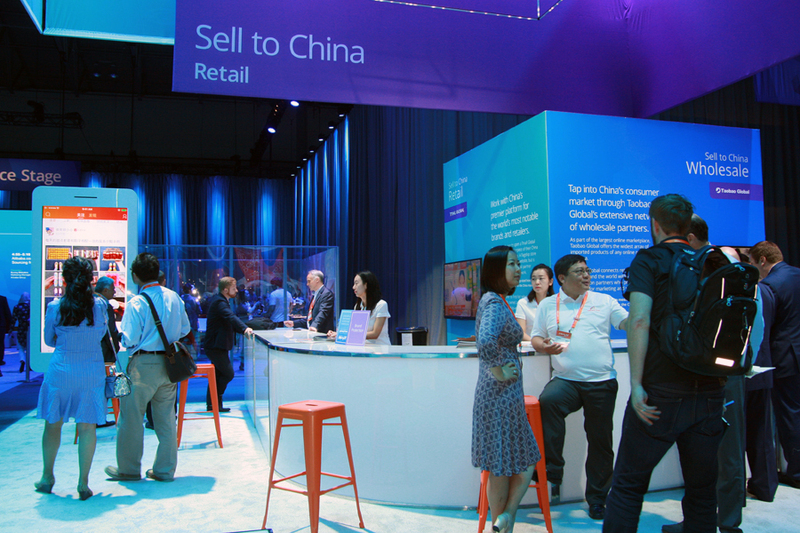 At the show floor’s entrance is what Alibaba calls its “China opportunity section” – a series of statistics outlining the opportunity for Canadian businesses, presented in an eye-catching way. “Before you understand Alibaba’s business, it’s important to know what this opportunity looks like,” Chan says. 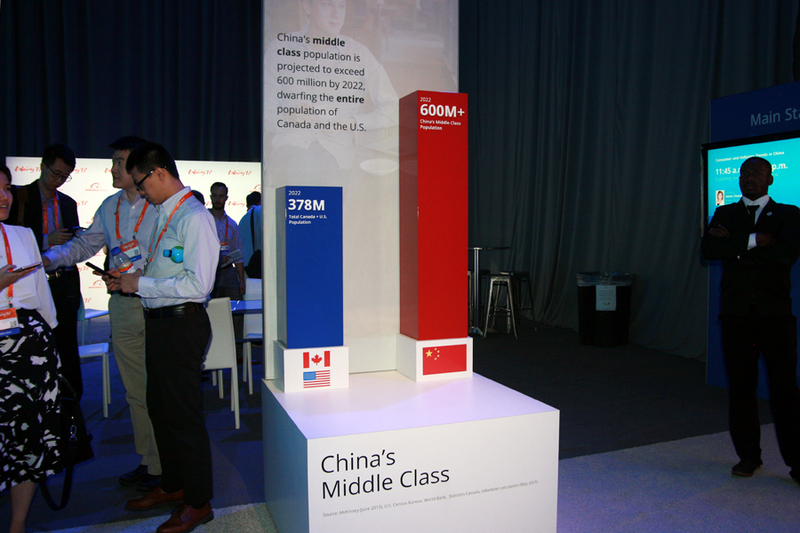 Here, visitors are informed that the country’s middle-class population is expected to exceed 600 million by 2022 – larger than the populations of Canada and the U.S. combined. 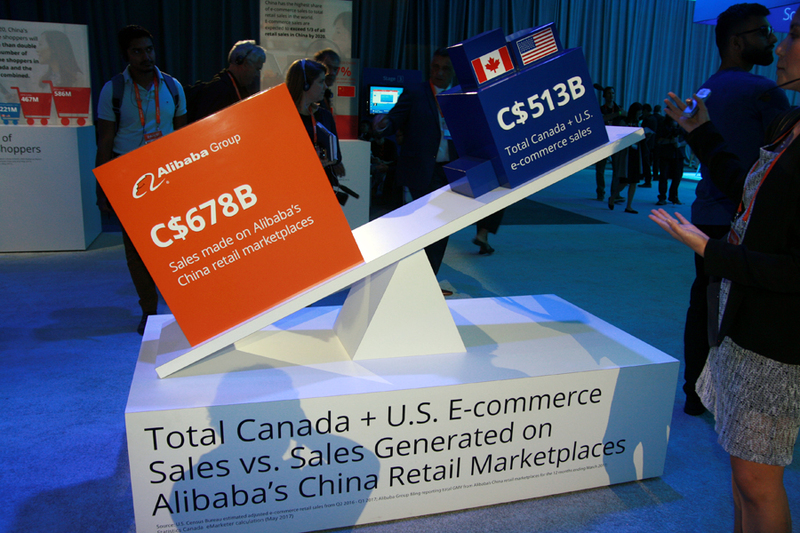 And here is Chan’s favourite illustration of how the Chinese economy is shifting from one based on manufacturing and exports to one based on imports and consumption – not only do sales on Alibaba alone outweigh (literally) all U.S. and Canadian ecommerce sales, but ecommerce is expected to represent 37 per cent of retail sales in China by 2020, according to Alibaba, compared to 10 per cent in Canada. 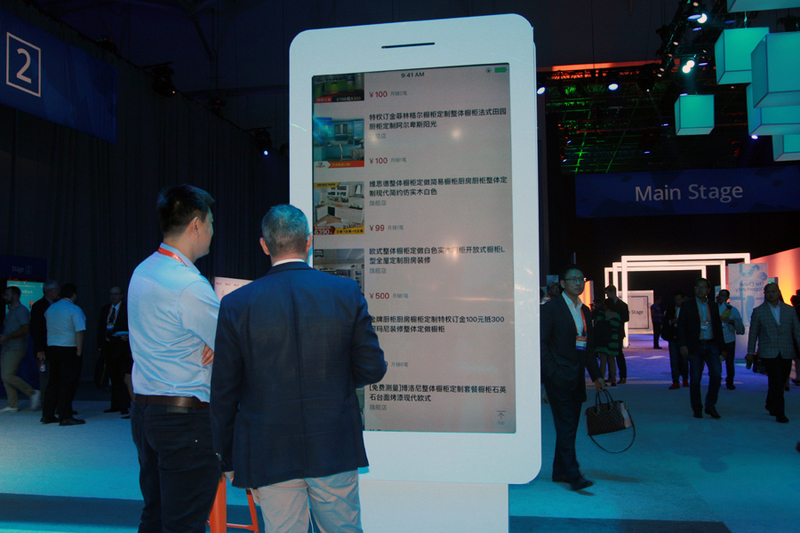 This massive iPhone is demonstrating Alibaba’s mobile Taobao Marketplace app, the primary entry point for most Chinese to Alibaba’s various ecommerce services. Lest you dismiss Alibaba as China’s Amazon, Chan assures us it’s more like Facebook, Google, YouTube, Pinterest, Twitter, and Amazon in a single app. 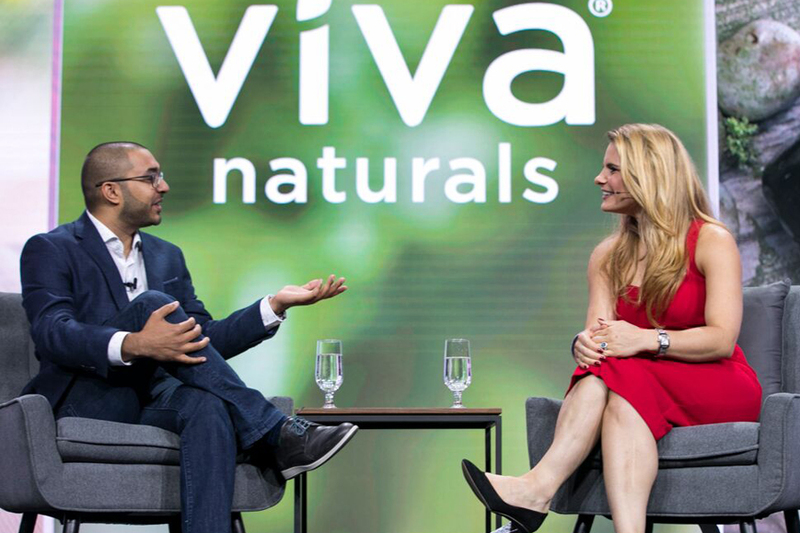 In addition to making purchases, users can chat with each other, interact with sellers, or watch livestreams – ultimately spending an average of 30 minutes per day on it. 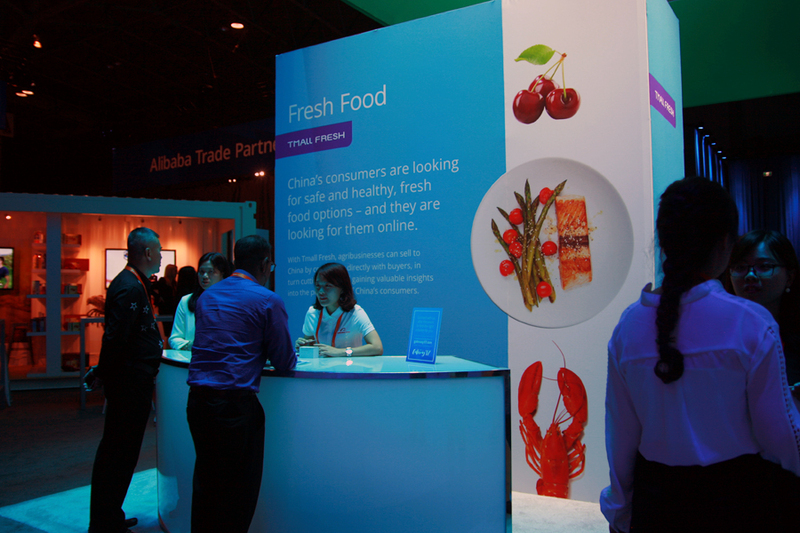 Nearby, the staff supervising Alibaba’s “Sell to China” are happy to explain the company’s ecommerce offerings for Canadian businesses of all sizes – Taobao for smaller retailers, whose products are frequently purchased in bulk and then sold by resellers, and Tmall Marketplace (on the left side of the screen) for enterprises with the resources to set up their own branded virtual storefront and interact directly with consumers. 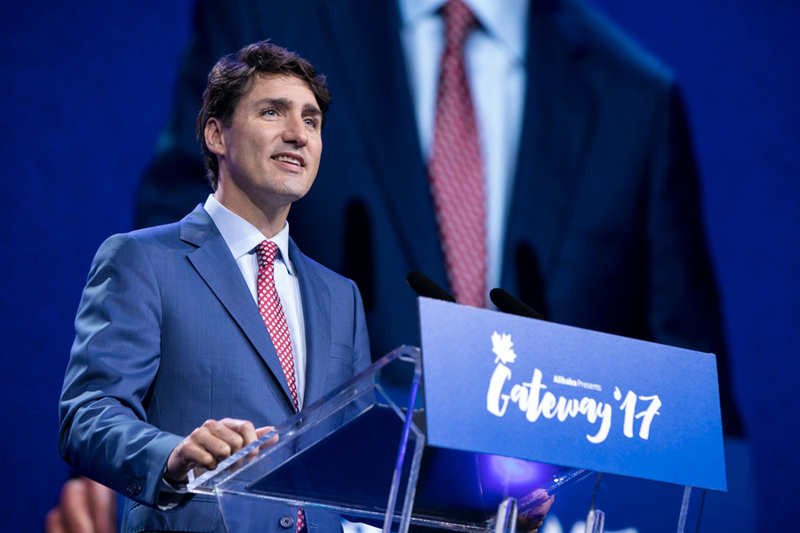 During the keynote, Trudeau and Ma both repeatedly mentioned the Chinese appetite for fresh seafood. The logistics, however, can prove a challenge, since it’s hardly as relaxing as a fishing trip to deliver a live lobster to China. Fortunately Ali Baba’s logistics arm, Cainiao Global, has done the legwork and can handle all shipping concerns for you. 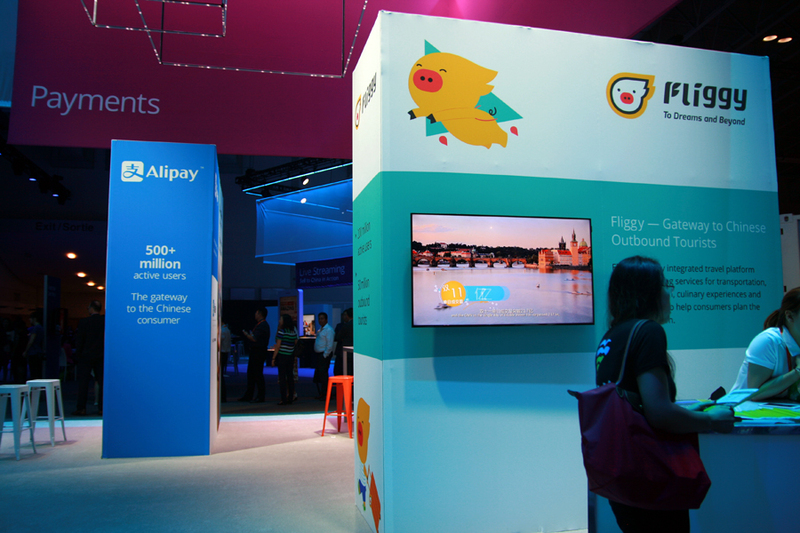 Payments and travel are both important components of Alibaba’s ecommerce ecosystem, with Fliggy acting as the country’s answer to Expedia, complete with flight and hotel booking options. Alipay, meanwhile, has more than 520 million active users and is a popular form of cashless payment in China, where few consumers own credit cards. Nine Canadian retailers set up shop in white shipping containers at Gateway ’17’s merchant showcase section, including Aldo Shoes Canada, outdoor clothing manufacturer Arc’teryx, and the Citadelle Maple Syrup Producers’ Cooperative. 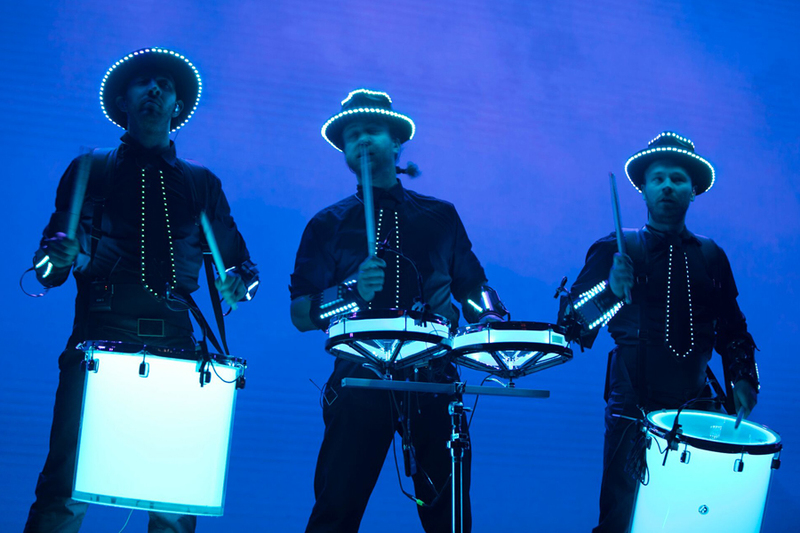 “We picked these nine because they’re a very good showcase of the variety of businesses that can work with Alibaba to tap into this massive Chinese opportunity,” Chan says. 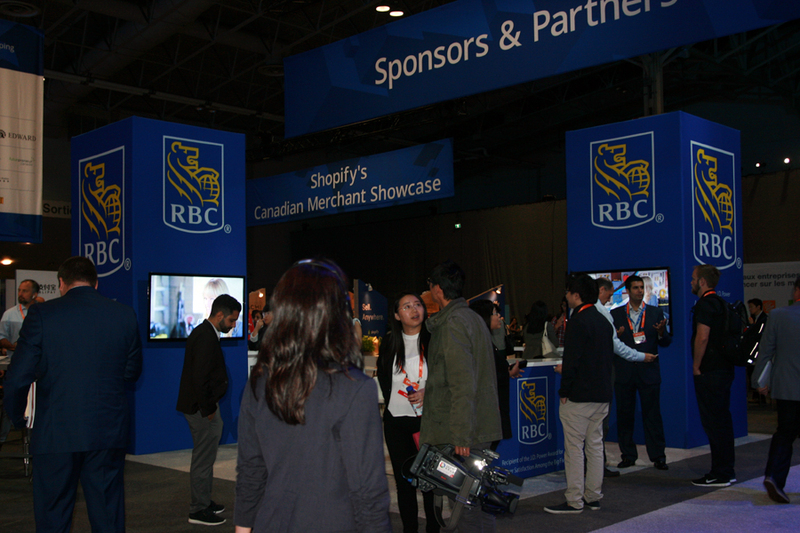 Royal Bank of Canada does not have offices in China, but as Gateway ’17’s largest sponsor, it enjoyed a prominent position on the showroom floor. 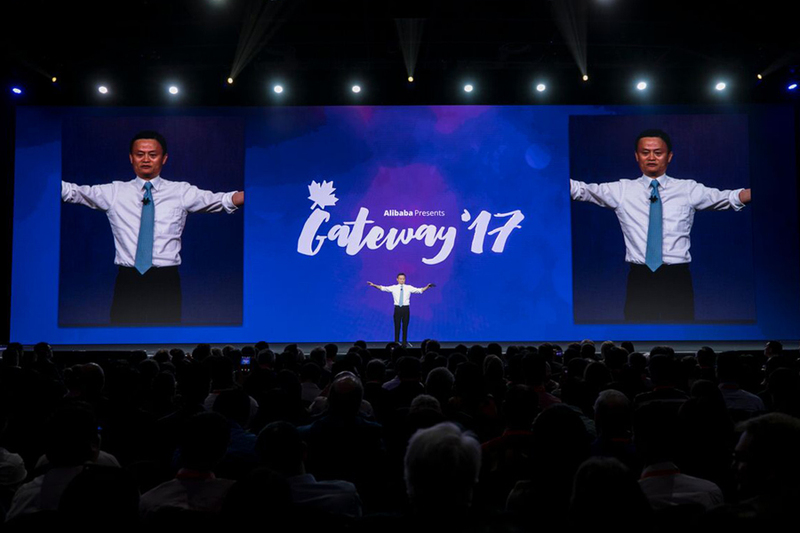 “Their goal is very similar goal to Alibaba’s – to make Canadian businesses global,” Chan says. 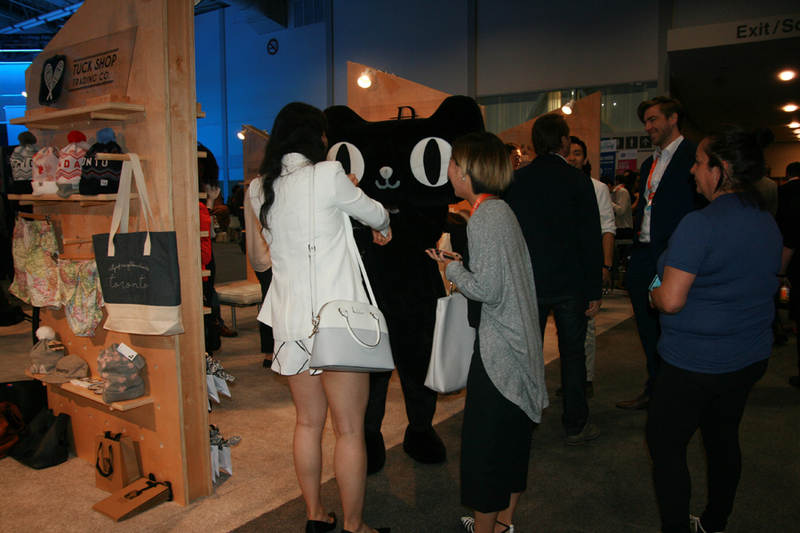 We don’t know who this mascot hanging around the Alibaba trade partners section (led by Canada’s own Shopify) is, but he seemed to be everywhere during the show.